Finally we can celebrate the finished design of our artist bungalows. These will be the inspirational spaces for artists to stay in, and will be the first building built on the site, hopefully if all goes well, by next May. With weather considerations... maybe December. Tropical storm season (and hurricane) is between June and November! Although we have been told by many locals that are in their later years, that they have never experienced a hurricane. Still, we hope to avoid raising our first building in a storm. ;-) Here is a mock-up of a single on the site, granted it is facing the wrong way. The windows will (of course) be facing the beautiful beach. Maximum capacity with three bungalows will be: 18. We expect average occupancy to be a much more intimate: 6-10.The difference will be a study abroad student group, verses a season of professional artists on their own. Each bungalow features two giant picture windows looking out over the atlantic ocean, and a set of french doors with a view of the Caribbean. Designs for the Artists Bungalows are DONE. Now it is time to tackle the big Gathering House. After months of going back and forth with the engineering department of our builder we finally have designs that meet the 150 mile an hour wind bearing (to keep safe from those potential hurricanes). 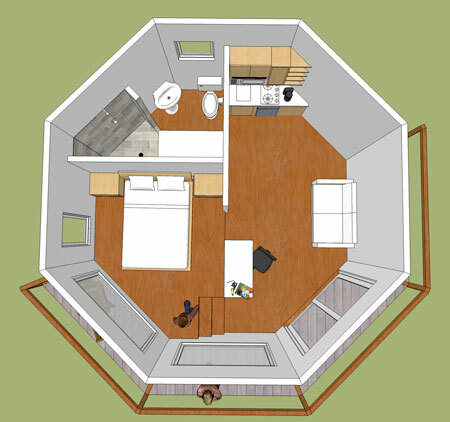 Wanting desperately to keep big windows in our artist bungalows for a fabulous view of both coasts (you can see both sides of the island from our land) we tweaked as many details as possible to get what we wanted without sacrificing safety. 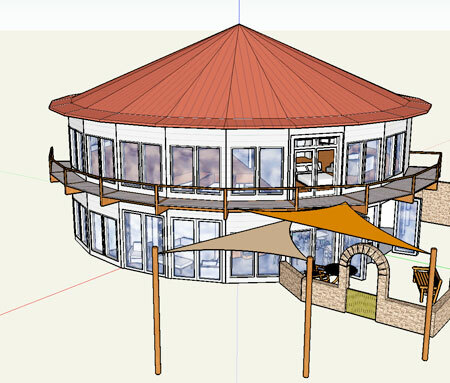 The easy route would have been just to make all the windows smaller and be done, but what would the point be in having a sea-side bungalow without a really great view of the sea? So we persisted and the final drawings have been done. Now we just wait for the quote for what will be the first of three bungalows. They will all be identical and so we are on to the next design...the big building. This will be the hub of activity for Exnihilo. Two stories, 2500 square feet each, will contain the community dining area, conference/workshop/studio space, and the Exnihilo Gallery smack in the center of the whole deal. A detail of the artist bungalow. 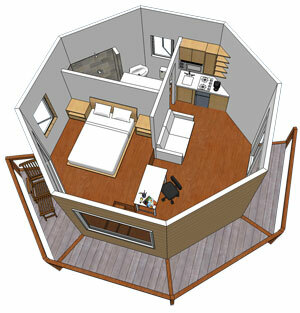 Each level is 325 square feet with kitchenette, a raised sleeping area and living/work area. The bath will be fitted with a washer/dryer. The second story will have an added sleeping loft. Large picture windows will let in the view of the Atlantic ocean and french doors will allow view of the leeward side with its tourquiose waters. A major step today. Scary, exciting, and somewhat insane. Signed a contract to get the wheels rolling on our first and second structure for Exnihilo. Entering into a contract with anyone always makes me a little paranoid but the company we are working with are making the process so easy that I am actually looking forward to it instead of dreading all the potential roadblocks. Working with different companies the last few years in the remodeling of our home has made me a little road weary, but a little wiser. Hiring on anyone to do anything can be a nightmare if you and your contractor are not on the same page, or even if your expectations of quality are not in sinc. That is why after much research the company we chose seemed a perfect fit. Proceeds from the Dancing in Thin Places show are helping fund the design phase of the first two buildings. Thanks to everyone who bought something! We are also accepting donations.